> Research Library > Epsilon > Spring 2012 Email Gallery Look Book: Creative ingenuity awaits you! 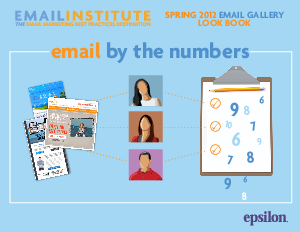 Email Institute is proud to debut the Spring 2012 Email Gallery Look Book. Take a glimpse at the brilliant emails that captivated Epsilon's attention this year. See which marketers follow email marketing best practices and how they achieved success.